South Africans are known for a good braai and to get a real authentic flavour requires firewood that will be easy to light and burn well, creating a good coal base over which to roast a selection of meats. Sekelbos wood is a South African wood of choice of soft wood. As it is important to cook your meat at the correct temperatures. Sekelbos also adds a lovely smokey flavour to the meat which is quite popular. In the UK, a mixture of Olive wood and Oak would be a good choice for its smokey flavours and regular consistent supply. Great Meat, Great Fuel, Great Food. The smell of roasted chestnuts at the Christmas markets is when you know Christmas is nearly hear. There is almost nothing better then holding a bag of warm chestnuts on a cold night, its like a little bag of love. Chestnuts are actually rather easy to do at home on your fire or in your stove, so why not give them a try. Make sure that you give them a good rise with warm water as this will prevent the chestnuts from burning. Once rinsed, pierce with a knife to make sure that these little chestnuts don’t pop and start flying across the room. Either place them into a cast iron pan or loosely wrap in tin foil prior to placing in your fire. Cook for a few minutes on a high heat and then enjoy! Many parts of the UK , especially London are smoke control areas where you can’t emit smoke from a chimney unless you’re burning an authorised fuel or using exempt appliances, eg burners or stoves. The fine can be up to £1,000 if you break the rules. – Lucky for you that all our fuel is permitted. A good choice for those in an exempt area are any DEFRA approved stove. DEFRA approved stoves will have satisfied even more stringent emission tests for air quality. Their air wash technology along with the stoves efficiency make the stoves a worthy investment. Always follow the manufacturer instructions for guidance on what fuel can be used in the appliance. You can use outdoor barbecues, chimineas, fireplaces, pizza ovens or smokers. Which Is The Best Wood To Use For Firewood? A low quality firewood, Alder is a hardwood that’s a member of the birch family. Alder is also used for smoking and flavoring meats. The wood gives off a sweet smell and flavor and is bet used for cooking. Wet alder produces a lot of smoke and leaves behind a lot of ash. Apple gives off a pleasing sweet aroma when burning and burns slow and steady. This firewood comes at a higher price compared to other similar hardwoods. Recommended for cooking/smoking. Considered to be one of the best woods for firewood in winter. It has a low water content and burns at a steady rate. Beech has a high water content so only burns well when seasoned or kiln dried. Often beech is turned into briquettes which burn really well. Birch is an excellent firewood and will burn easy with a large flame. However, it does burn very fast so is best mixed with slower burning wood such as Ash or Oak. Birch can be lit by peeling its bark to create a natural firelighter. A good firewood for making kindling, which burns well with a pleasant cedar smell. Burns well with a pleasant smell however, this is best used in cooking or in stoves due to the risk of spitting on an open fire. A good firewood but contains a very high water content it must be dried very well. When dry, elm will produce a high amount of heat, you may need to mix it with another faster burning wood such as Birch to keep it burning. Burns comparable to oak. Burns very hots with a high flame due to its oil content, so not suitable for all stoves. Burns fast with a pleasant smell and without spitting. Hazel is a good all round firewood when dry it burns well without spitting. It's not a very common firewood and hard to source as it has many other uses and benefits, wonderful firewood and nuts but because of its' flexibility it is also used for making hurdles, stakes garden furniture. Holly is a fast burning wood that produces a nice flame but gives off little heat output. Holly can burn when green, however it is a poor quality wood for fires. A lower quality wood that we would only recommend if you was given it as free firewood. Larch is not recommended for indoor use as it produces an oily soot than can build up in your chimney. Oak is considered as one of the best firewood’s, it gives off a good amount of heat and burns reasonably slowly. Oak is a good wood for use in wood burning stoves for those cold winter nights. Olive wood comes in lumps or nuggets range than logs like most wood. It is very good for use in smoking foods and gives of a lovely aroma that is perfect for meat and fish. Olive wood burns for a long period and is best to mix with other cheaper woods when burning to reduce costs. Often used for kindling, pine burs very quickly and smells great. Sweet Chestnut burns well after it has been well dried. It is known for spitting and therefore is not recommended for indoor use. Walnut firewood is a good quality wood that burns clean, is easy to light and has a pleasant aroma. It doesn't burn as hot and as long as other woods like Oak, but is far superior than other softwoods such as pine and fur. A heavy, large tree that uses up a lot of time and energy to process, therefore not recommended for regular use as this is a costly firewood. If you buy your logs from Log-Barn then you will know that your firewood is nice and dry and ready to burn, but if you have brought your logs somewhere else then here are a few simple checks that can help you decided if a log is dry or still damp. Burning dryer wood is more efficient as energy is not lost removing the moisture and this allows the wood to burn hotter and longer. So it is always advisable to burn wood that is driest. 2. Dry wood often tends to shed it’s bark and the end grain can show sings of cracks or splits. 3. When handling dry wood/logs they will feel warm and dry, whilst wet wood feels cold and damp. 4. Dry wood is easy to light, burns well and gives off lots of heat. 6. Damp wood is difficult to light, often hisses, spits and smokes a lot. The heat given out will be little in comparison to dry wood. Additionally, you can always check how dry firewood is by using a moisture meter. These will provide you with the moisture percentage of your logs. Good wood for fires is considered to be under 20% to make sure you are getting as much heat for your money as possible. Kiln dried wood is wood that has gone through an oven to dry out the moisture and should always read under the 20% mark. How to fire up your wood fired oven using pizza oven briquettes. For all you authentic wood fired pizza lovers, it’s crucially important to get your oven to the perfect cooking condition. This involves generating a high and consistent temperature for your oven, the optimum temperature means the optimum quality pizza. Using a good quality fuel such as kiln dried wood (Pizza Oven Logs) or what is commonly used in restaurants, pizza oven briquettes (Beech Briquettes) becomes a vital part to a crispy pizza. Kiln dried like silver birch, a wood with a moisture content of under 20% is also good for your pizza oven. Silver birch is often used when cooking bread products in the oven as it infuses a sweet smokey taste to the food. Kiln dried wood has been dried and has a much lower moisture content than seasoned wood, which we wouldn’t recommend using for cooking with. TIP: If you are seeing excessive smoke when burning your logs then this is most likely due to a high moisture content. Always keep your wood as dry as possible. Light the firelighter, if using the briquettes these will light and stay alight once lit. if using wood then you may require extra kindling to boost the flame. Leave the fire burning in the center of the fireplace so that the stones become nice and hot. Once you have got your fire going, if using wood then begin to add more wood to help build a more aggressive fire. once the pizza oven starts to approach the desired temperatures, use a scraper or tongs to push the logs/briquette to the outer walls of the fire, creating a good size area for your pizzas. You can either use a laser thermometer to test the temperature or you can throw a handful of flour into the oven, if it catches on fire then the temperature is good. The perfect pizza oven should be roughly 450°c, with a hot stone base and a nice rolling flame across the roof of the oven. This cooks the pizza from the top and bottom, giving you amazing results and a pizza to be proud of! The cold winter months are upon us and its the time of year that everyone starts to light their stoves for a cosy evening in front of the fire. We thought it would be a good idea to test our Beech Briquettes to see how the alternative flue would perform in a MORSØ 7943 wood burner stove. The Beech Briquettes are easy to set alight, so we used one firelighter and no kindling to get our stove going. The firs step was to break the briquette into 2 or 3 pieces, this can be done by gently hitting the side or dropped on the floor. We got 2 larger pieces and one disk shape piece of briquette which was perfect for our stove. After lighting the fire it took about 5 minutes for the start giving off some heat. Once the whole briquette had caught and the embers start glowing it began to break into smaller disks and as you can see in the picture above. This gave off a great amount of heat and was a lot hotter than when using kiln dried wood. We will definitely be using these when it gets really cold. Silver birch is a great firewood to use for your stoves and fireplaces, not only does it burn great but the bark can double up as a natural firelighter and therefore makes silver birch one of the easiest woods to light. The white bark of birch is easy to peel off the log and when scrunched together creates a combination between a firelighter and some kindling. Peel enough bark off so that you have a small hand full and then you will be ready to light your stove fire. Position your logs in the stove so that you can place your bark peelings in between the logs. Place a small log over the top of the birch bark kindling and then light the bundle. After a few minutes your logs should catch alight and your fire will be coming on nicely. Silver Birch’s bark is more flexible than other woods so it easy to peel and crunch into a bundle, If you are using other types of wood then you may not see the same results and may require to use some natural wood wool firelighters. Firewood is one of the cheapest forms of fuel to heat your home during the cold winter months. There is nothing better than coming in from the cold outside to be met with a roaring fire, one that draws you closer and gives your whole body a warm hug. Not only does a fire provide you with heat but it is a great way to bring the family closer together and makes the festive season a happy, memorable one. Sitting around the fire with a warm cup of hot chocolate for many is what winter and Christmas are all about. If you happen to have a wood burner stove instead of an open fire then you can also benefit from using the fire to heat up food and drinks. Using a good quality cast iron casserole dish placed on top of the stove will ensure that there is a lovely hot treat waiting for you and the family after a walk in the snow. A cast iron kettle works wonders when sat on the corner of your stove. Ok, it’s not as practical as a conventional kettle, however, we can guarantee that you will enjoy your drink a lot more when it’s made in this way. If you have an open wood fire then you can still get the benefits of cooking with the heat of the wood by using a campfire tripod in your fireplace. The important thing to remember is to protect the food from the flame and just use the heat generated to cook your food. Unless you are toasting marshmallows, then chuck some more wood on the fire and get those flames going. If you are going to be using your fire to cook foods then it would be wise to consider what fuel source you are going to use. One of the benefits of kiln dried woods is that you know that it has no chemicals or nasty elements that will taint your food. Try using fruit woods for a subtle infusion of flavour into your food, Olive wood gives a nice sweet, smoky added taste to the food. If you do not have any cast iron dishes to use for cooking you can still benefit from cooking with the embers as well as getting the children involved as well. Try cutting a slit down a unpeeled banana and then inserting some chocolate buttons inside. 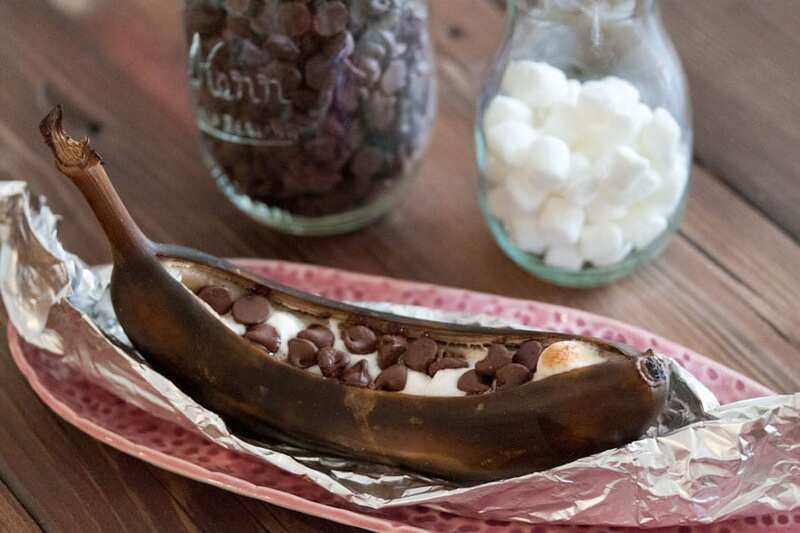 Once you have an even amount of chocolate in the banana, simply wrap it up in tin foil and place it on the embers. After a few minutes, you have a wonderful melted chocolate treat. These are best eaten with a spoon, just scoop out the filling and enjoy. For an added treat add some mini marshmallows as well. With the official launch of the bio-bean coffee logs™ on 20/10/16 the log barn website managed to receive a mention on thesun.co.uk website.